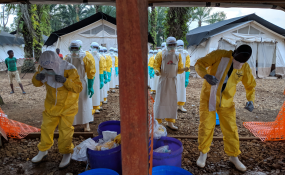 "Whatever the official status of this outbreak is, it is clear that the outbreak is not under control and therefore we need a better collective effort. The virus has not spread to neighboring countries so far, but the possibility exists. "What is most important now if we want to gain control of this epidemic is to change the way we are dealing with it. We need to adapt our intervention to the needs and expectations of the population, to integrate Ebola activities in the local healthcare system, to engage effectively with the communities, and to further explore promising vaccinations to strengthen prevention. "Choices must be given back to patients and their families on how to manage the disease--for example, by allowing people to seek healthcare in their local centers rather than in an Ebola Treatment Center (ETC). We owe this to our patients."